LANCASTER – The Lancaster Museum of Art & History (MOAH) is calling all local artists to submit work to “Innovations”, the upcoming 29th Annual Juried Art Exhibition. Last year’s show had more than 200 works vying to be exhibited in the Museum’s South Gallery. This year, the Museum would like to surpass that number. The exhibition will run from January 23 through March 13, 2014. The submission deadline is January 3, 2014. Any work which has been produced in the past three years and has not been shown at the Museum of Art & History, formerly the Lancaster Museum/Art Gallery, is eligible for submission. In addition to the opportunity to show artwork in the Museum, accepted entries are also eligible for cash prizes and other awards. All forms of artistic media, including, but not limited to, painting, photography, and mixed-media are welcomed. This year, online submission is the preferred method of submission; however, applicants submitting in person may bring their exhibition-ready artwork(s) to the Lancaster Museum of Art and History by Friday, January 3 for consideration. 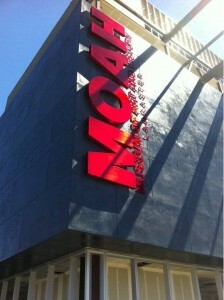 Submitting artists should first pay for their submission(s) via the MOAH website: www.lancastermoah.com. Click the “Juried Art Exhibition” image for submittal instructions. After the payment has been processed, a receipt number will be generated. Next, the submission form can be found at http://www.lancastermoah.org/artwork-submission.php. Select “29th Annual Juried Arts Exhibition” in the “Submission For” tab from the drop-down list of options. The form will then ask for the payment receipt number generated earlier. Next, upload digital images of the entries. A maximum of three pieces may be entered for consideration. A number will be assigned to each entered piece to ensure the anonymity of judging. The entries will be judged by southern California artists Ray Turner, an American artist known primarily for his portrait and landscape painting, and award-winning sculptor Sarah Perry, who resides in Tehachapi. For a complete listing of eligible zip codes; additional information regarding this year’s jurors; complete payment and submission information; and comprehensive eligibility and framing requirements, visit http://www.lancastermoah.org. Questions concerning the payment process should be addressed to Lancaster Parks, Recreation, and Arts at 661-723-6077. Notification of accepted pieces will occur on January 8, 2014. A list of accepted entry numbers will be posted on the museum’s website and at the Parks, Recreation, and Arts counter at City Hall, 44933 Fern Avenue. The Museum of Art & History is located at 665 West Lancaster Boulevard. Hours of operation are Tuesday through Sunday, 11 a.m. to 6 p.m., with extended hours on Thursday until 8 p.m.
For information regarding the museum, exhibits and upcoming programming, visit http://www.lancastermoah.org. 3 comments for "Enter MOAH’s 29th Annual Juried Art Exhibition"
This article on the MOAH has been here for 3 days with no comments. Has anyone viewing this site been to the museum or, if so, more than once. It always looks deserted. Is this another one of those Rex projects that went nowhere? I’ve seen the building for a LONG time, long before Rex was put in. It always appears empty. I’ve often thought of going, either by myself or taking a girl there (sweet date spot…) but I’m always thinking that is is closed, so I’ve never visited. Guess I’ll give it a view now that I know its open. Hopefully the curator isn’t over exuberant at a guest showing up though.